A Thanksgiving dinner you can print? That's either a stroke of genius, or the most terrifying thing to happen to cooking in centuries. Traditional methods of cooking turkey are inefficient and wasteful, and so the Master Computer has decreed that from now on all Thanksgiving dinners will come in the form of extruded paste. Using the 3D Manufactu-Printer, Citizens will form this paste into appropriately festive shapes, and then cook and eat it, giving thanks to the Master Computer for providing such bountiful sustenance. Around half of that previous paragraph was made up, but whether it's the right half rather depends on your feelings about pureed turkey paste squeezed out of a home-made 3D fabricator. 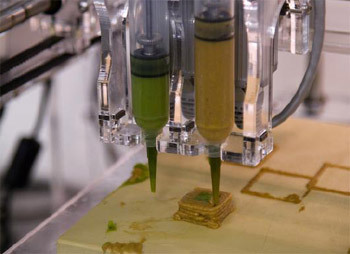 Working with the [email protected] project, which is an open source "mass-collaboration" aimed at bringing 3D fabrication to people's home, David Arnold of the French Culinary Institute has hit upon the "future" of food, which is apparently paste formed into odd shapes by machine. Using the Mark 2 version of the [email protected] fabricator, Arnold was able to create a small dome out of turkey paste, as well as a cube filled with an unknown green paste. Presumably, printable turkey is supposed to be a good thing, but I can't get over how utterly unappetizing it looks. Apparently it tastes just like regular turkey when it's cooked, and I'd assume it looks better as well, but I don't think it's going to get many people to trade in their roasting tins. There are something that science and technology can make better, but looking at this, a delicious turkey dinner isn't one of them.